‘Birds first title since ’83, or Spartans’ threepeat? 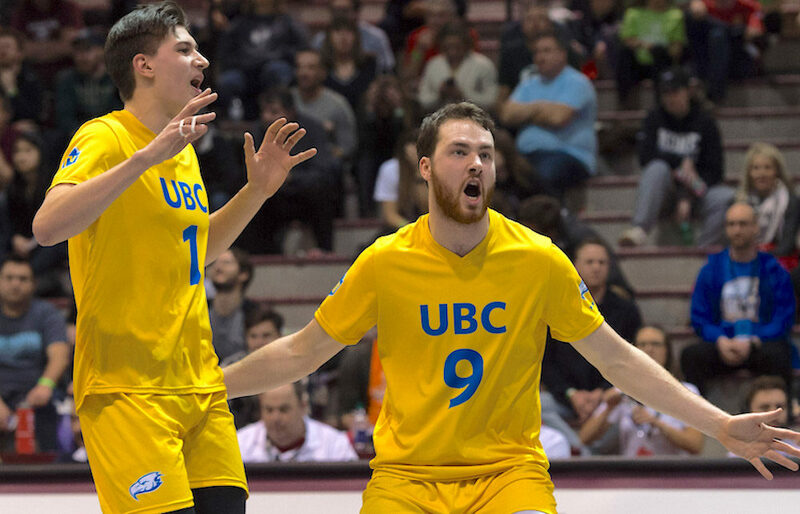 It’s UBC vs. Trinity Western for U Sports national men’s volleyball spoils! Hey volleyball fans, get out your history books because Sunday’s U Sports men’s volleyball national championship final is going to be all about the excellence of the sport in B.C. …no matter what ends up happening. “I know a lot about that team,” chuckled UBC Thunderbirds head coach Kerry MacDonald on Saturday night from the championship site at Hamilton’s McMaster University, of the ‘Birds crosstown rivals from Langley, the Trinity Western Spartans. All of this came in the moments after the second-year boss led his ‘Birds to a 3-1 (25-17, 25-18, 22-25, 25-20) win over the Alberta Golden Bears in the national semifinals, setting up the highly-anticipated all-B.C. derby against Langley’s two-time defending champion Trinity Western Spartans on Sunday (1 p.m PDT). UBC’s Byron Keturakis earned Player of the Match honours with seven aces. And all of this sets up a championship script which couldn’t get any better. UBC, enjoying a renaissance under MacDonald, has not won the national title since 1983. Trinity Western is trying to become U Sports’ first men’s volleyball program to win three straight national crowns since Winnipeg won four straight from 1970-71 through 1973-74. They are also trying to become the first program ever to win Canada West conference and U Sports national titles concurrently in three straight seasons. As well, the two teams split their two meetings this season. UBC won 3-1 at the Langley Events Centre over TWU on Feb. 9, but the Spartans traveled to War Gym the next night and beat UBC 3-2 on their own floor. MacDonald saw a lot of good signs Saturday against Alberta. “I think it showed some of the character and resiliency in our group,” he said of coming back from a loss in the third set to win it all in the fourth. The Spartans are the much more season group when it comes to the Saturday semi-final drill yet McMaster came ready to play. Josephson gave all the credit to the Marauders for their first set win. Eric Loeppky led TWU with 23 kills, Pearson Eshenko had nine kills from his middle blocker spot and hit at a .750 percentage, while setter Adam Schreimer had 51 assists.